Equipped with a powerful Briggs & Stratton twin-cylinder 20 HP engine with ReadyStart auto-choke starting system that powers up easily, with no choke or priming necessary, the Poulan PRO PP20VA46 riding mower is one of the most powerful and easy-to-use mowers. The pedal-operated Fast CVT automatic transmission means there's no need to clutch or stop to change speed or direction. Capable of reaching top speeds of 8 MPH, it operates a lot like an automobile; just push the pedal and go. The 46 in. 13-gauge reinforced steel deck and cast iron front axle provide exceptional durability, stability and long life. The mow-in-reverse feature keeps blades engaged for continuous mowing while shifting between forward and reverse directions. With a spring-assisted deck lift with 6 cutting height positions and a super-tight 6 in. 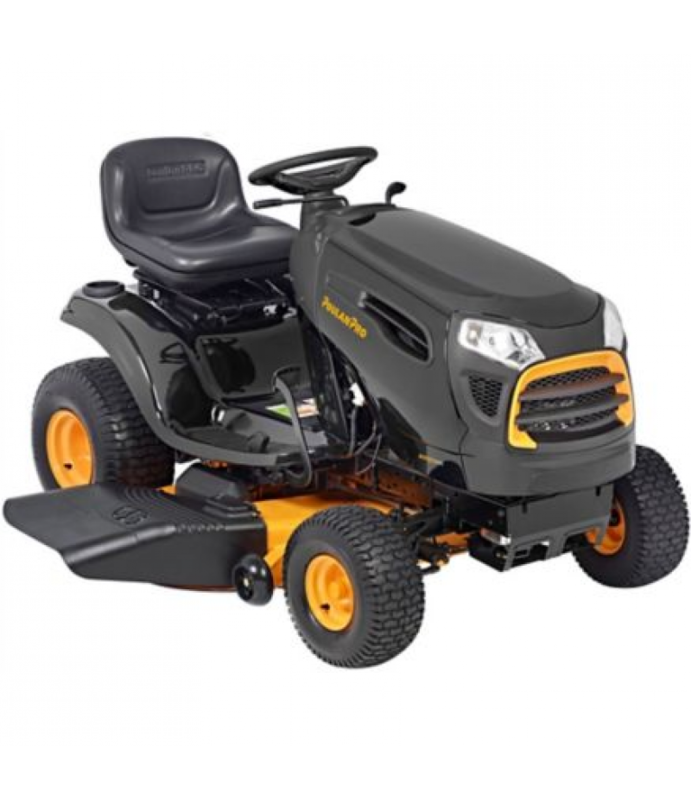 turning radius that's perfect for maneuvering around challenging terrain and obstacles like trees, shrubs and flower beds, this riding mower is ideal for yards up to 2 acres with flat, hilly or uneven terrain.